The field of Eastern Carpets and rugs is of the most complex and diverse with such a wide variety of types. Their beauty is also not always appreciated as it should be. If one looks at the fine quality rugs (ie: those with a greater density of knots per square inch and often incorporating silk) then these would come from the following areas. Kashan types from Iran (formerly Persia) are widely popular. Kashan is a city in the Northern Province of Isfahan and carpets and rugs have been made here since the 17th Century, although production has been greatly increased in the 20th Century. 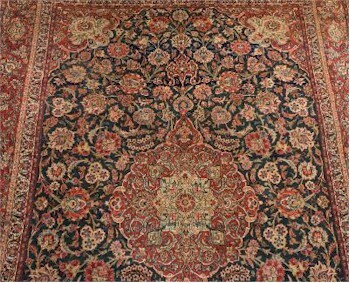 A typical Kashan rug (FS24/753). The Iranian city of Isfahan itself is also known for high quality rugs. Weaving flourished in the Safavid era but virtually finished when the Afghans invaded Iran. It was not until the 1920s that weaving was recommenced and Isfahan rugs are highly sought after. The quality is evident when one realises that they are knotted at the ratio of 500–700 per square inch. Designs on Isfahan rugs include the tree of life and Shah Abbas. The most famous workshop is that of Seirafian. Often of similar design to the Kashan rugs are Kerman or Kirman rugs. Kerman is a city in central Iran and rugs have been made here since the 15th Century. 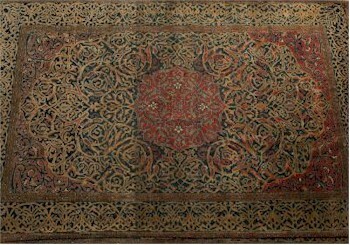 Other high quality rugs include those from Qum (or Qom), which were often woven with silk threads and tightly knotted. The Holy City of Qum is located about 100km to the South of Teheran. The tree of life design is often used in the design of Qum rugs. Hereke rugs are often of similar quality. The town of Hereke is near Istanbul in Turkey. The Hereke Imperial factory was established by the Ottoman Emperor Sultan Abdulmecid in 1843 to provide carpets and other fabrics for the Ottoman Court and for the Dolmabahce Palace. Turkish carpets are amongst the most sought after, particularly large examples, often in colours of green, orange and yellow. Flat woven kilims are known to date back to 7000 BC and with Turkish rugs, grain and camel bags are often used as tent decoration. In the United Kingdom, the production of carpets and rugs has been carried on for several hundred years, with perhaps the famous names being those of Axminster in Devon and Wilton, near Salisbury, in Wiltshire. The Victorian William Morris not only produced designs for wallpapers and textiles, but also for carpets as part of the interior design company which was originally founded with Edward Burne-Jones, Philip Webb, Rosetti and others and which became Morris and Co in 1875. William Morris designed carpets can be found in his former country home of Kelmscott Manor.